Hessa Alhemel has been inspired by the people, places and spaces she has encountered her whole life. As a child she dreamed of creating clothing and taking her fashion fascination to the next level as she designed for her dolls in Kuwait. Years later, Hessa Alhemel womenswear was created. 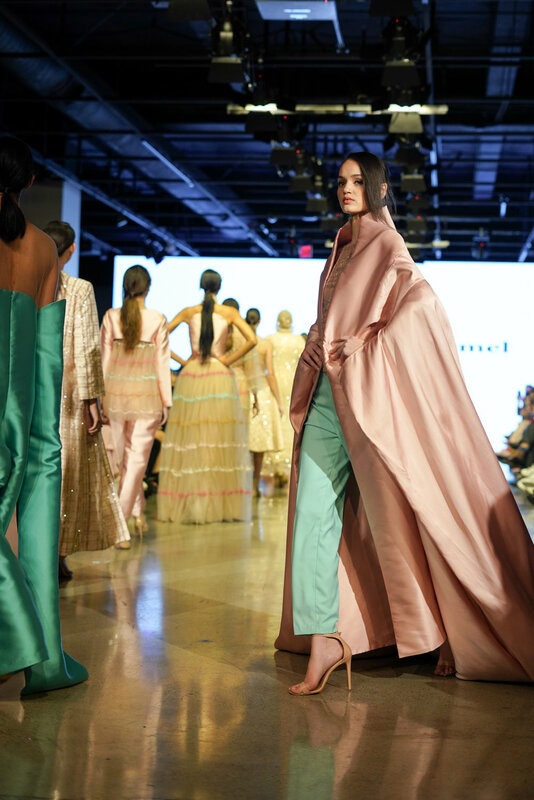 Shown through the “Stories from Arabia” showcase at LAFW, Alhemel’s “The Yard” collection debut 13 looks inspired by spring sunsets, the architectural design of Arabic houses and the intricate doors that decorate them. Rich rust oranges and jewel toned jades shine off of satin fabrics and create splashes of color in a mostly fem-pastel and beige pallet. 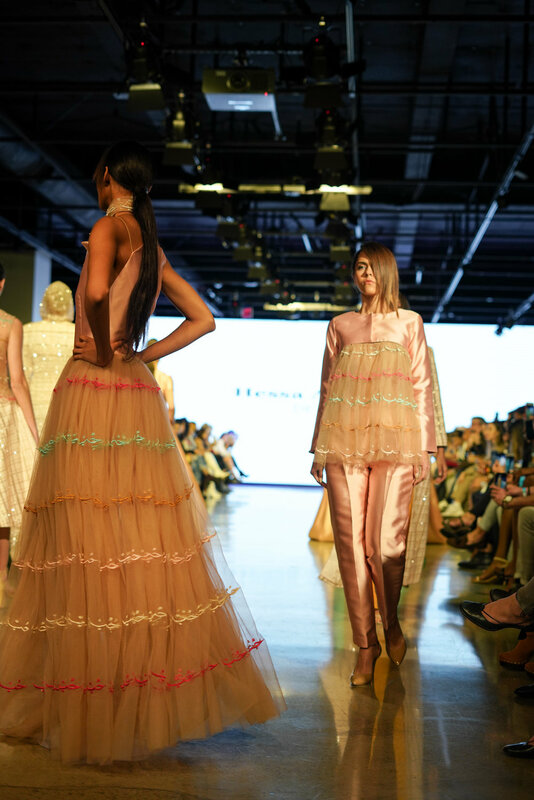 Quick moments of flamingo pink and fuchsia accentuate the Arabic writing embroidered into the garments reading, “ Behind every door is love.” The collection shimmers just as a spring sunset kiss over a vast meadow. “The Yard” collection does an effortless job of being modest and simplistic, but also being breathtaking and applause worthy. Although Alhemel makes her inspiration is clearly to the audience, the collection is #AccidentallyWesAnderson. It’s a gem amongst an industry of loud clothes and missed opportunity. Just as The Grand Budapest Hotel is a breath of fresh air to cinema, Alhemel has created a works of art in that have the ability to stand out on the runway without much help from the models speaks volume There are stories embedded in these garments that go past what meets the eye. 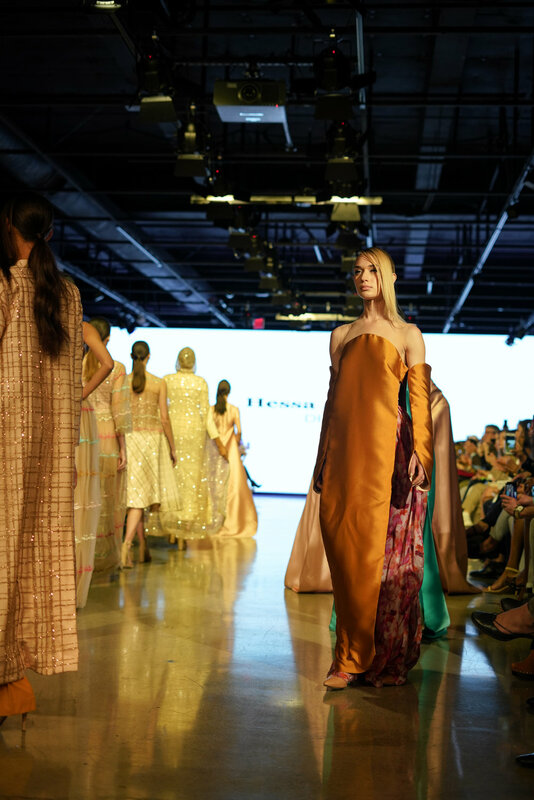 From an aesthetic point of view, the collection is much more than just fabric and color.